Howdy folks, first scripting post. Just set up a nice XP MM-driven music server for my stereo, been ripping and organizing like a loony tune, and had fun writing my first script. 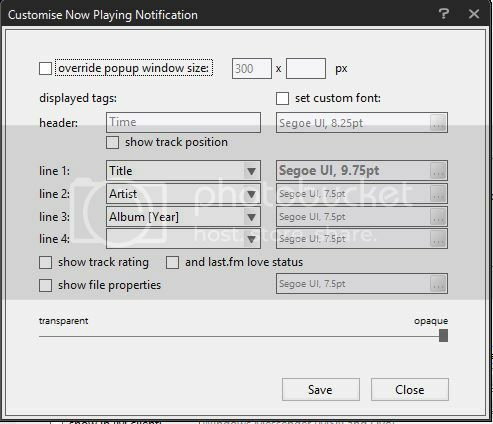 Big Now Playing sizes itself (window, font size and such) according to your screen size and by truncates long lines of track info (rather than using smaller font sizes and wrapping). "Complete" track info is reported at the bottom of the window in small text to make it easy to take a closer look. 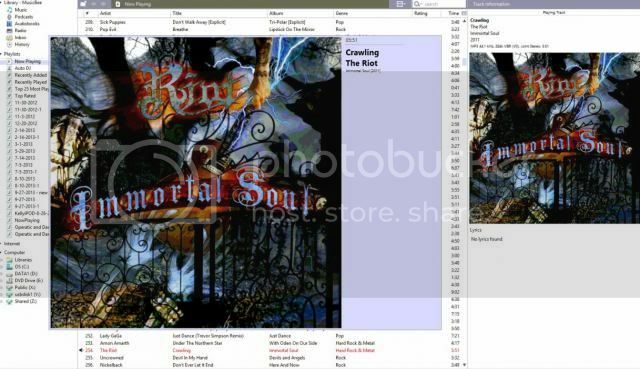 It also displays album art, if present. The script requires an activeX component for IE6 or later, which is likely already on your system. I plan on testing it on more screen resolutions and making it configurable. Install it by simply copying it to the Auto folder in your scripts folder. Bug reports (preferably with steps to reproduce), suggestions and other feedback welcome. Feel free to comment on the code. Last edited by spitzer on Sun Jan 10, 2010 11:04 am, edited 1 time in total. I think you forgot to attach the script? Also you might want to post this in the Addons forum. Yeah forgot the link. Thx. I've edited the post and include it here: http://consulting.rootaction.org/dev/bi ... ing1.0.zip. Was waiting to post to the Addons forum in case there was some feedback here on some significant error in approach. It would be great if you could add an On/Off functionality! I'd love to see a screen shot. Thanks! Bex wrote: Cool, I like it! This would be a great help. Also, I think Stardock's Windowblinds is making it invisible (although I can probably fix that by adding the script as an exception, maybe?). But yes, it has definitely been a boon when I take my laptop over to a friend's for dinner parties. I realize this is an old thread, but I have been on the lookout for something like this for a while! I originally posted back in 2011 looking for something similar, although I was thinking along the lines of a screensaver at the time. This script works great. I've included a screenshot. Thank you for making this available. This MM Add-On is exactly what I want; but I can't get it to work properly. Artist: Eagles; Track: Hotel California; Track number: 117; Album: Complete Greatest Hits; Album artist: Eagles; Length: 6:30; Format: mp3"
So, all the information is there but it's not being displayed. Does the same whether there's album art or not. I love this script too, but since I upgraded to Windows 8, the script errors out. I basically get a runtime error now in Windows 8, so I had to remove the script. Hopefully the script will get updated. EDIT: If I need to post a screenshot of the errors, I certainly can re-enable the script and do that. Let me know. Thanks! EDIT 2: Here are screenshots of the two errors. Hope these screenshots help someone who can modify this script to work properly in Windows 8. Thanks in advance! If there are no plans to update this script for Windows 8, are there any other options I can consider in MediaMonkey? 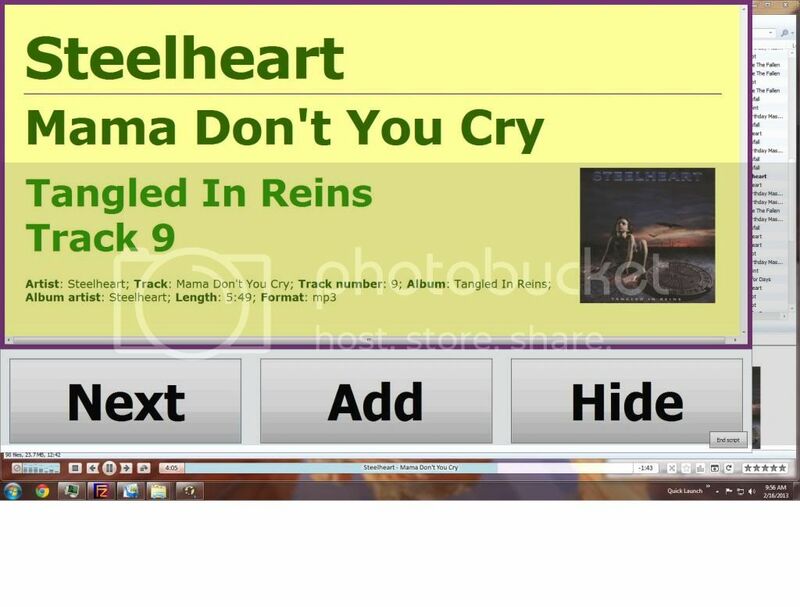 I really want an option to see what is playing on our media computer from across the room. This script worked great prior to Windows 8. If anyone has any other suggestions for a large or scalable 'Now Playing' popup window, I would love to try it out. Hope this all helps as suggestions for MediaMonkey. Bump for fixing the Big Now Playing script or implementing a similar playback mode natively in MediaMonkey. deusdiabolus wrote: Bump for fixing the Big Now Playing script or implementing a similar playback mode natively in MediaMonkey. Yes, please! I really prefer to have MediaMonkey as my primary/one-and-only music player all around. Just following up again in hopes for a fix for Windows 8/8/1 for this script, or something similar for MediaMonkey. Since we haven't had any response from the author, or anyone else who may know how to fix this VB script, I have tapped some other resources to see if we can get this script updated to work with Windows 8/8.1. I will post back as soon as I have an update. I really want this script to work again! If I only knew how to code VB scripts!